MARVELLOUS Concorde Hotel Singapore’s Moooncakes is AWARDED The Travelling GourmetTM’s BEST PACKAGING AND DESIGN AWARD FOR MOONCAKE 2014! HOWEVER, the packaging is Superb! Get this…it transforms into a most decorative and tasteful box to hold your Knick Knacks like Gold bars and jewelllery OR, and this to me is the BEST part…it becomes a decorative table lamp! The bulb and electrical cables are supplied too! There are those who will say: when I want to buy a lamp I don’t go and buy mooncakes! (one old friend actually told me that jokingly…) IGNORE them! They cannot think out of the box! I LOVE this idea! Brilliant!!! 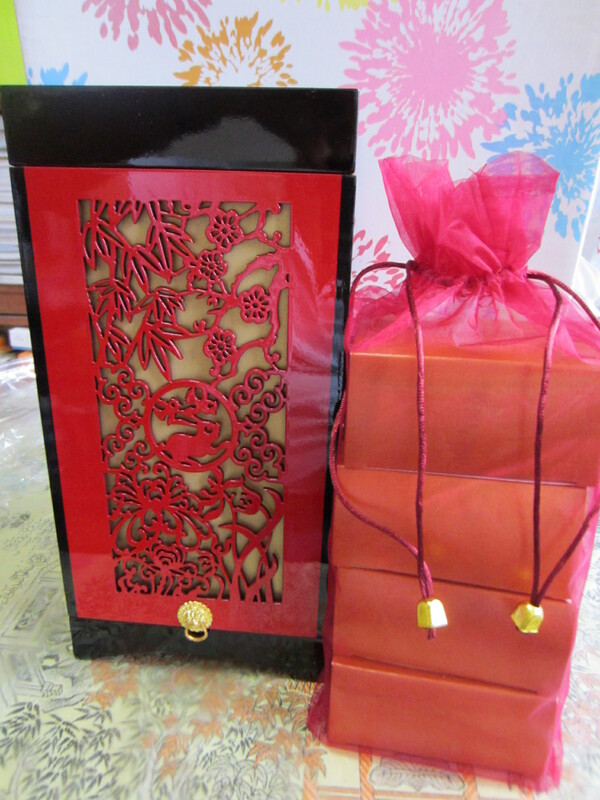 Usually most people just throw away the boxes after enjoying the mooncakes. This is a much better idea! The lamps/boxes are in four different auspicious colours. Personally, I like the red one for Good Luck! Try the more unusual flavours like Japanese Red Azuki Bean and slinky smooth White Lotus Black Sesame. ENJOY! At this link is the theme from… MOONRAKER! I played this song way back in 2003 when I was the very FIRST gourmet in the world to match Mooncakes with Wines at the Singapore Marriott Hotel! This entry was posted in Art, Chocolates & Desserts, Fabulous Food, Gourmet cuisine, Hotels & Resorts, Let them eat Cake..., Snacks & Little Bites and tagged Concorde Hotel Singapore Mooncakes, Dr. Michael Lim is The Travelling GourmetTM, Lotus Seed paste with single yolk, Mid Autumn Festival. Bookmark the permalink.